We're looking forward to our upcoming studio showings. 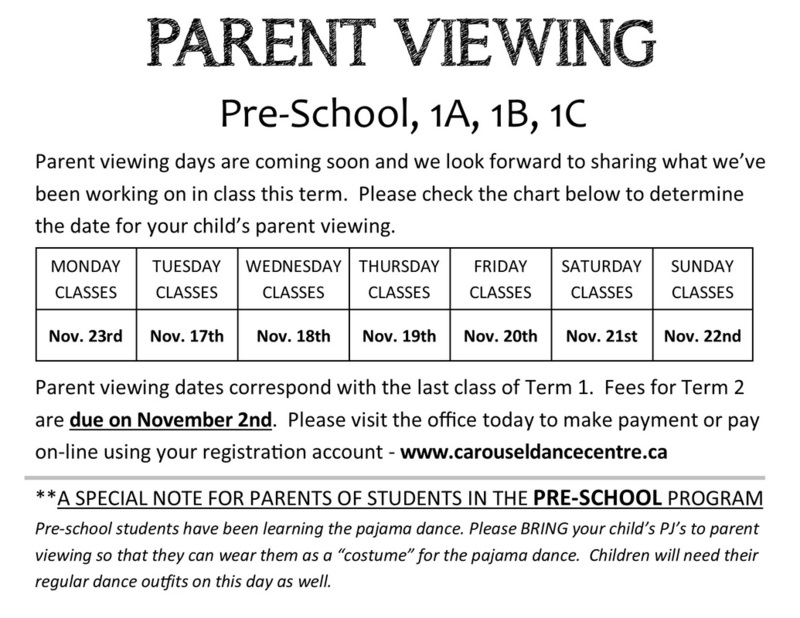 Please see details below to determine which day your child performs. 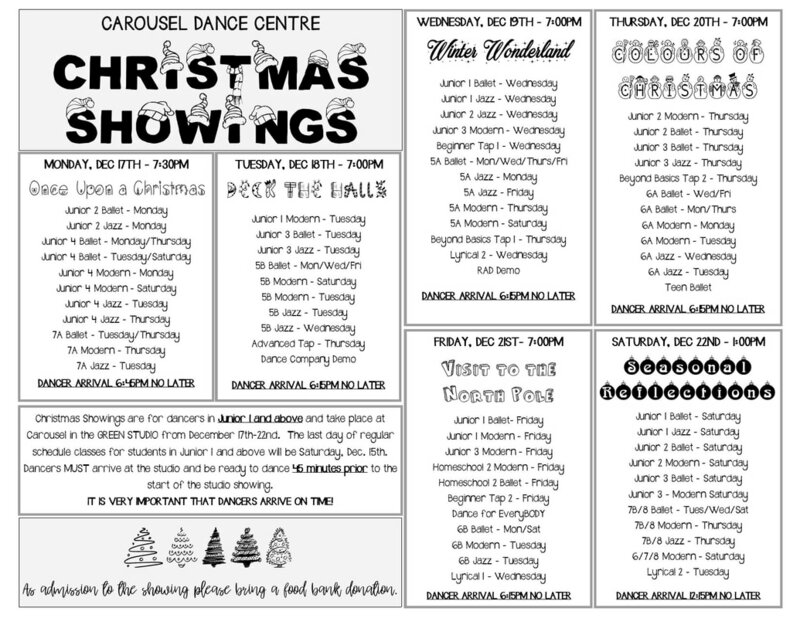 Looking forward to our Christmas Shwowings this week. 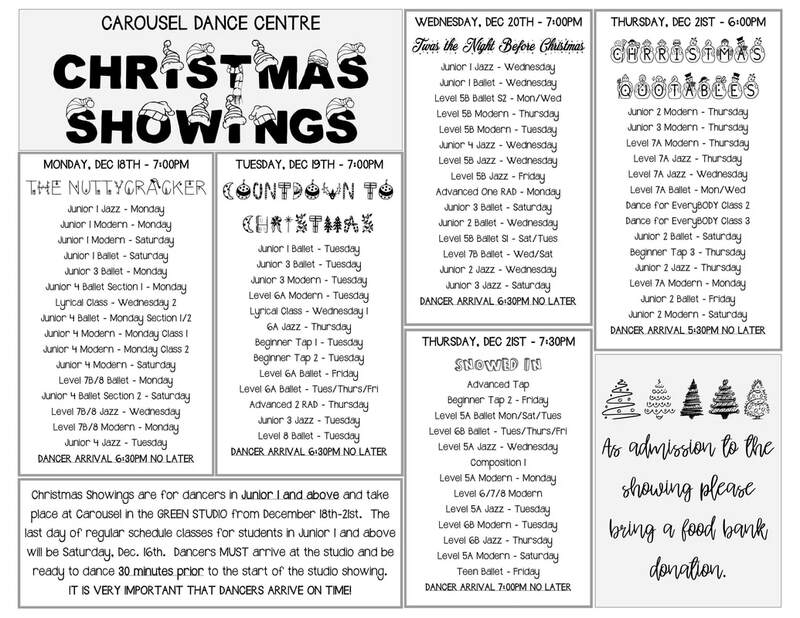 Please make sure students are at the studio and ready to dance a minimum of 30 minutes prior to the start of the showing. The ﻿August newslette﻿r is now available. Thank you Carousel families for your donations - 278 pounds of food collected for the Food Bank of Waterloo Region! So much fun at our PA Day program today! A special visit from our company dancers. Students met the Sugar Plum Fairy, Dancing Bears, Ballerina Dolls and more! 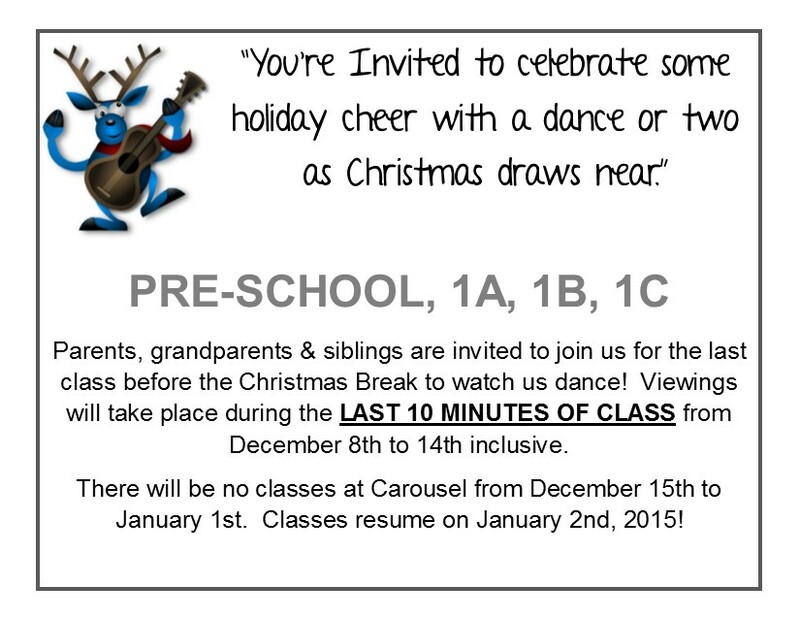 Looking forward to our remaining Christmas Break dance camps. 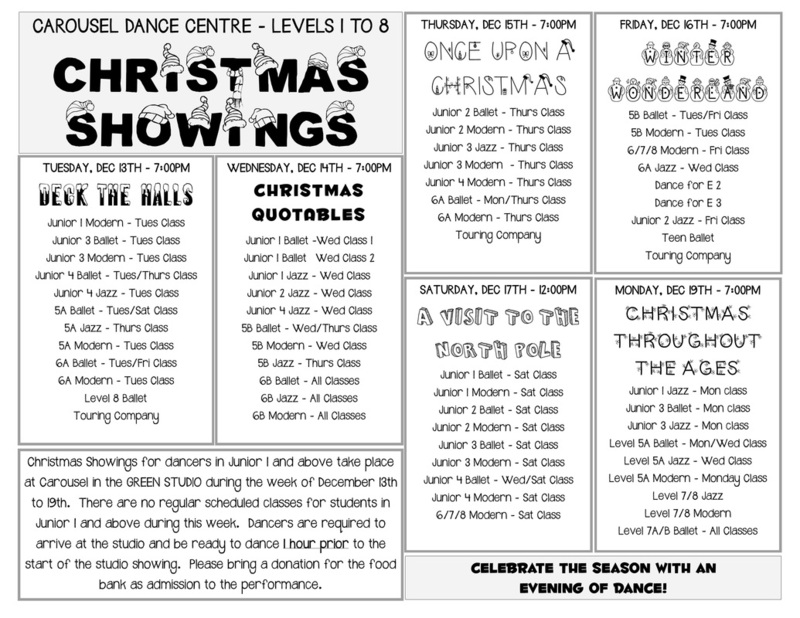 Congratulations dancers & teachers on a greet week of showings - a great way to end 2015! The theme for this year's spring performance is Cinderella and Tribute to the Big Band. We're looking forward to another great performance. Costume deposits are due December 18th. Please review the details below. 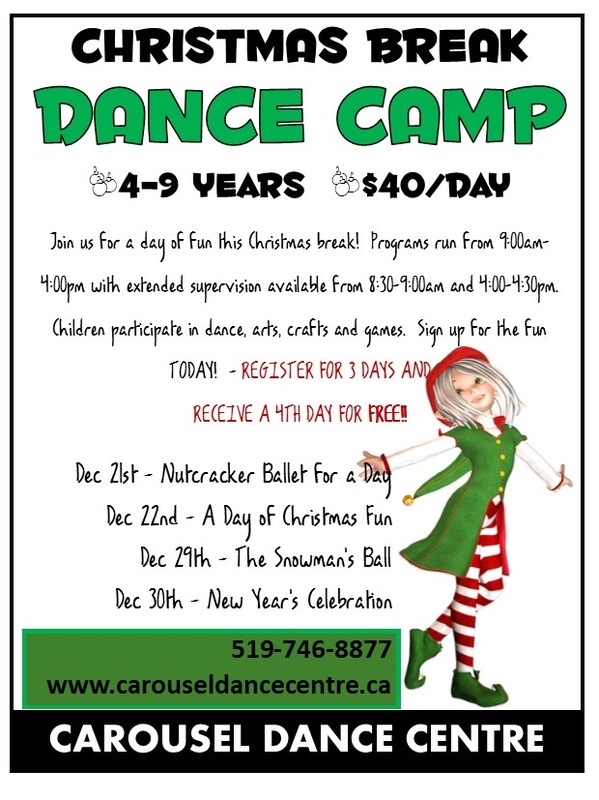 Registration is now open for our Christmas Break Dance Camp. 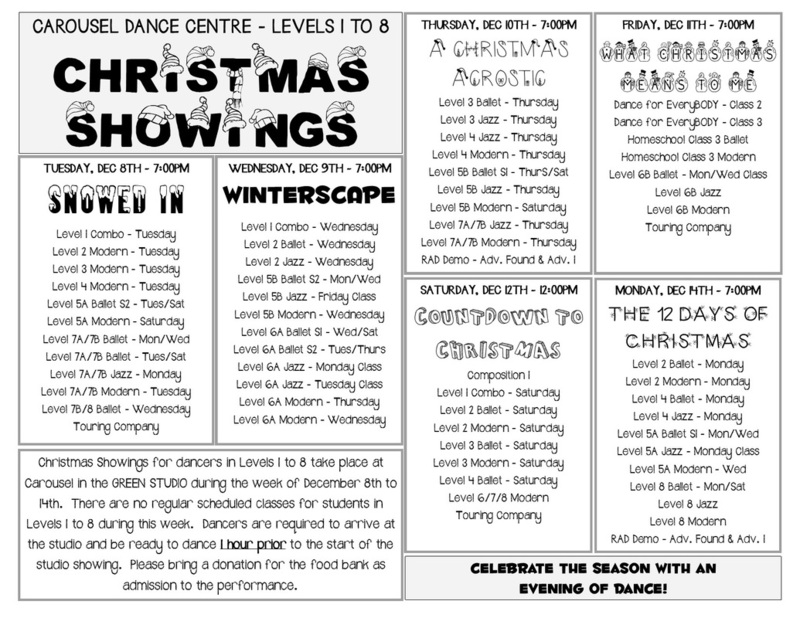 Students in levels 1 to 8 are involved in our annual studio Christmas Showing. Please find details listed below. 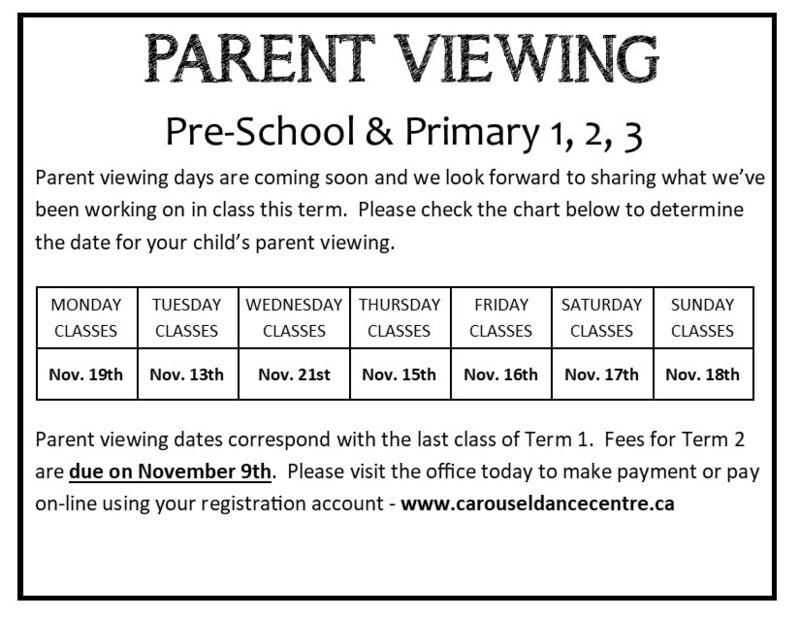 Looking forward to seeing parents at our viewing this week. Dates and details can be found below. The studios were lots of fun today with dancers dressed up in their unique and creative Halloween costumes. 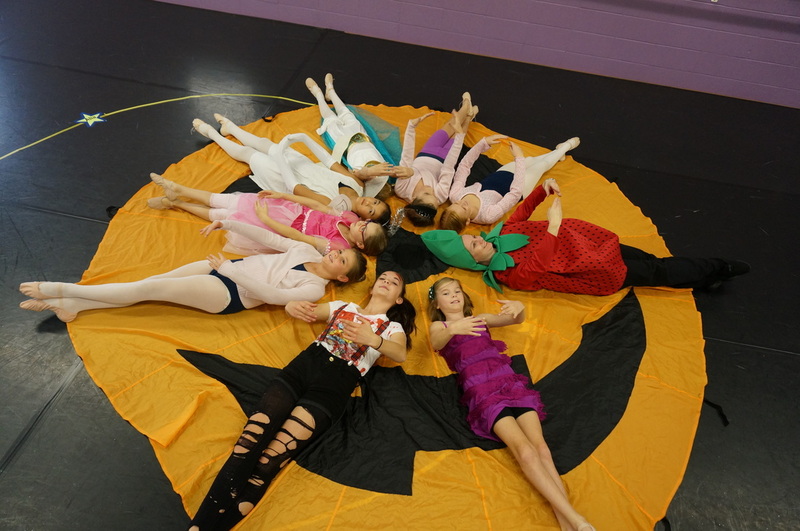 Using our Halloween Parachute was a "spook-tacular" activity in our younger classes and students of all ages enjoyed the great pumpkin search - there were 15 orange pumpkins hidden around the studios and many of our dancers were able to find them all. Even our staff had fun dressing up! 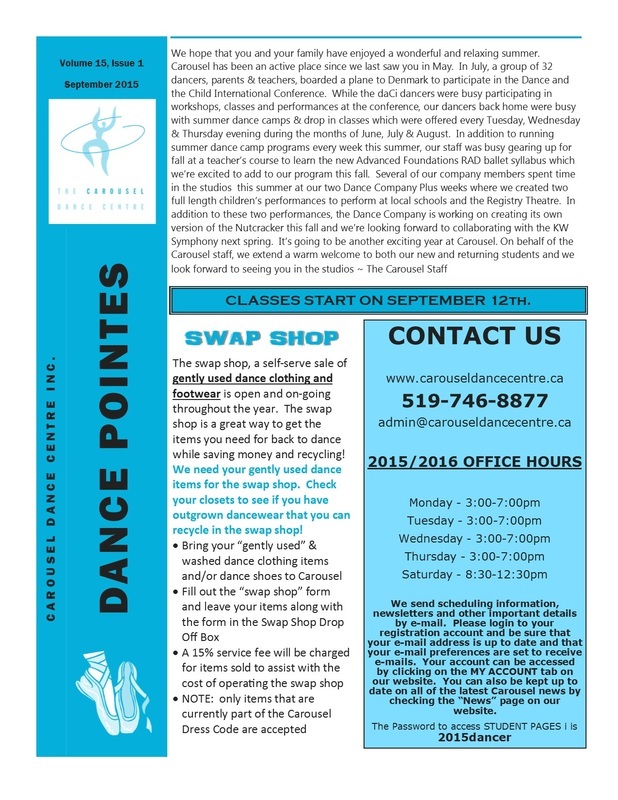 The September newsletter is available now. Click the link below to read the newsletter now. 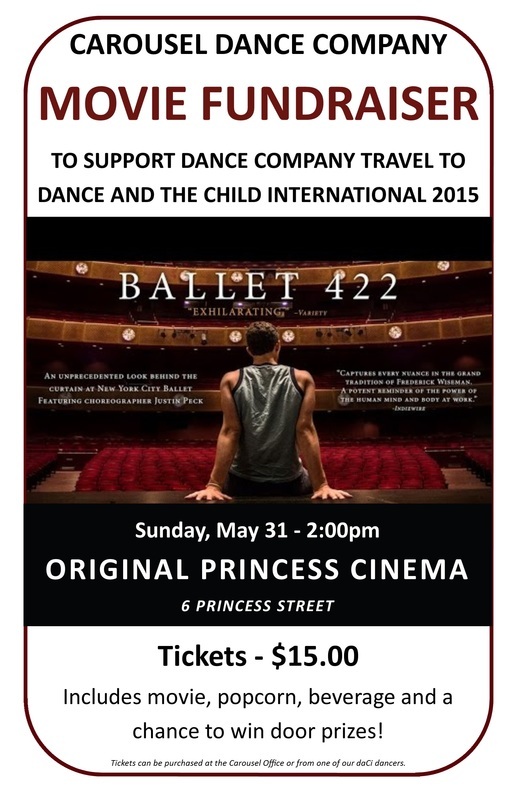 Join us this Sunday for our movie fundraiser in support of Carousel Dance Company's trip to Copenhagen this summer to participate in the Dance and the Child International Conference. Lots of fun and great door prizes to be won! Spring Session starts this week. 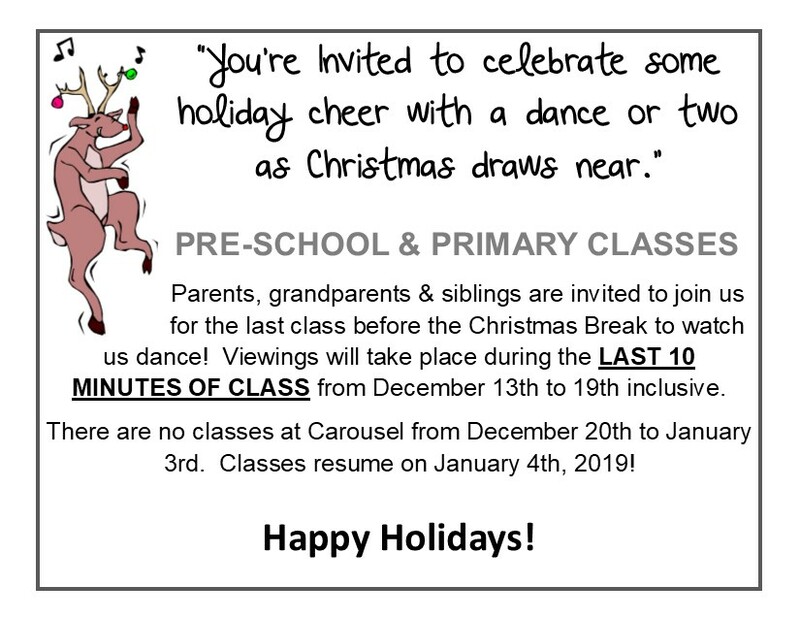 Lots of exciting programs offered including a Mom & Daughter class, Dance Friends (an exciting integrated dance program), Adult Programs and You & Me for children starting at age 18 months. 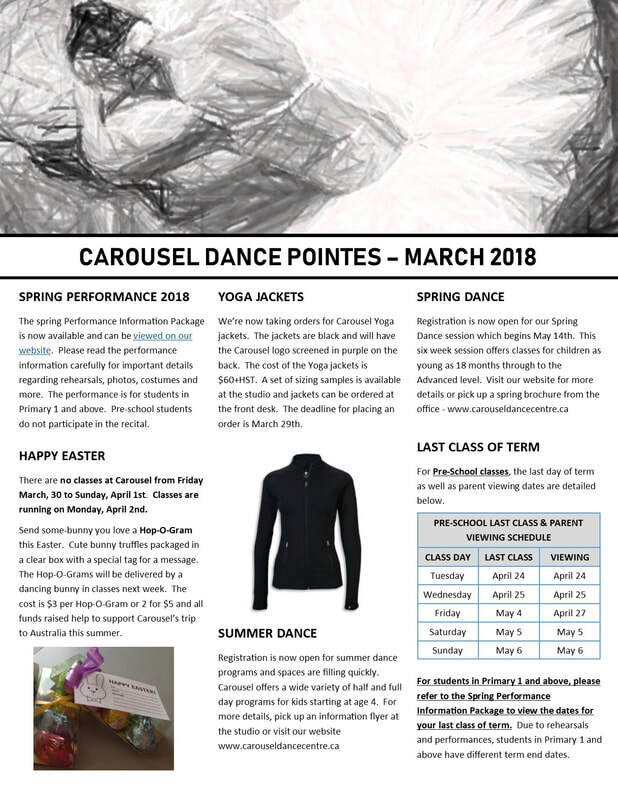 Click the button below to download a brochure with details of all the programs offered.